In this article I am going to explain you that How to create List Item Event handler using sharepoint feature. There are various event types. For more detail on various event types refer MSDN link. Here I will take example of Item Added & deleting action event. On added event, we will add item description and on deleting event, we will not allow delete. This article example shows the basic steps used to create an event handler. 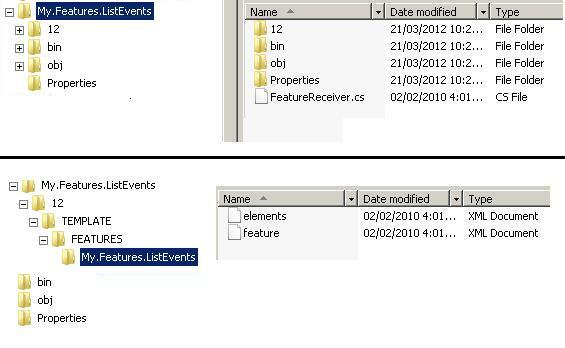 In this example, the event handler executes code before a list item is deleted or after an item is added. The example works on announcement lists, adding text to the body of new items and cancelling attempts to delete existing items. You create an event handler assembly in Microsoft Visual Studio by creating a class library. Add a reference to Microsoft.SharePoint.dll and inherit from the Microsoft.SharePoint.SPItemEventReceiver base class. The example overrides two methods: ItemDeleting and ItemAdded. Remember that the suffix “-ing” indicates that the event is being handled before the action occurs, and the suffix “-ed” indicates that the event is being handled after the action occurs. Please see below solution structure and Code. We will create below 2 xml file and 1 feature receiver file. Then rest is usual WSP deployment on sharepoint. You use this file to define the assembly that encapsulates the event handler, the class itself, and also a sequence number that specifies the order, if multiple event handlers are associated with the Feature. The following example shows how to bind an event receiver that responds to the events for deleting and adding list items. Awesome article. Simple and explained in a linear way…..